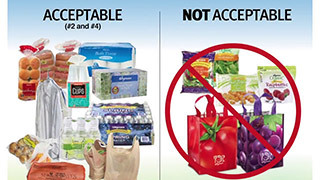 Plastic bags and product wrap are NOT accepted for curbside recycling! Plastic bags and product wrap can be returned to most major retail stores (Walmart, Target, Wegmans, Tops, etc.) for recycling. Many other types of plastic bags/wrap can be included as well. They are also accepted at ecopark. To determine if a plastic bag/wrap is recyclable, try the rule of thumb. If you can put your thumb through the plastic and it stretches, it is likely the correct type of plastic film for recycling (polyethylene often marked #2 or #4). Recycle the following CLEAN and DRY plastics with your grocery bags at the store or at ecopark. If a plastic bag/wrap is shiny, crinkly, or tears like paper it is likely not the correct type of plastic film for recycling (any film marked with a #5 or #7 should be disposed of). If it fails the rule of thumb and you cannot put your thumb through the plastic and make it stretch, it is not acceptable for plastic film recycling. Do NOT return these items with your plastic bags. Dispose of in the trash. Due to their multi-layer, multi-material composition, these materials are not accepted for curbside recycling or plastic film recycling at retailers. Click here to view select mail in programs for recycling.